First of all, I would like to thank Andy for publishing this article and give me the opportunity to share my experience. Many of us start with a dream of flying. 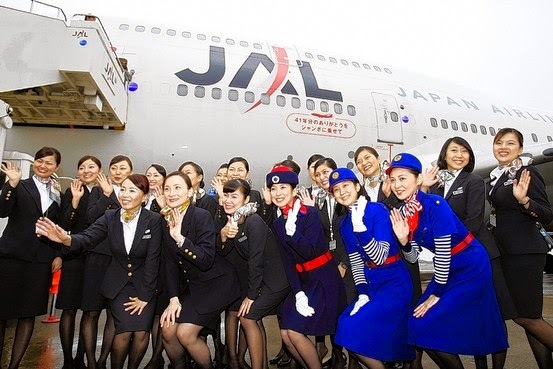 Compelled with the thought of flying around Japan, many people would eagerly apply for Japan Airlines. I mean, being Singapore based is a great thing because being based in your home country, you don't suffer from so much home sickness. Here, I will tell you the truth, the good and bad about being in JAL. That's being extremely optimistic about no money cut for I don't know what mandatory deductions. The training bus would usually pick us up at 7.30 SHARP ( in Japanese context, on time is late. Please be there 15mins early). And you will return home in the same bus around 8 if you're lucky, with smooth traffic. After a grueling 7.30am - 8ish pm weekdays for 3 months you finally get your name badge and uniform. Which is a great encouragement after all that stress about remembering exact Japanese-English phrases and in-flight Japanese. You also get your cabin handbag, cabin luggage and check in bag. But now, it is all secondhand. While many of us were luckier and got first hand. Somehow the company felt the need to cut costs and issue used bags. Uniforms for all crew is also on loan so it is your luck if you're getting it brand new or used. Shoes too, used to be issued but after a few batches, the new juniors have to purchase their on black leather shoes which have to be fully complied with company standards. When you are in your flight training, OJT ( on job training) you are not paid flight hours pay. That's almost it for training period. Here comes real flying. While they promise 2.5k a month, please note that is a rough gauge. Sometimes, you do get to take home 2.5k if you're very lucky and get the better flights. If not, an average pay would be 2.2k- 2.3k about 80-90hours. ( about 3 long 7days pattern flights). If that month you have any leave or Japanese lessons and can only manage 2, 7-days flights, please do not be alarmed if you only receive 1800-2000k. Even deserved bonus, have to be fought for by our union head which is always fighting a dragging battle with the office. Someone told me that they waited more than a year for their yearly bonus. Their 2012 bonus came in AFTER their 2013 bonus. As the company is very rigid. Many things that you point out is either brushed away or dragged until you give up. This is the general culture of a traditional Japanese company. Many people have pointed out that the pay is very hard as you have to spend when you fly so its almost impossible to save and thus many people have left. On average of people leaving is our of a batch of 16, 10 would leave.some batches only have 4 people left after their bond has ended. When I say spend, I mean on basic food and water. Crew in Japan Airlines have very low positions. You have to apologize with your lives if anything happens as usually, whether it is your fault or not, if you are involved in any passenger complains, you will be marked for it. Crew baggage is also the last to come out unlike other airlines. So after flight, be prepared to wait 30mins for you baggage. Crew wise, you are foreign based. So be prepared to be treated like a foreign worker. Japanese people always takes precedence over you. You usually have to do galley work, but unlike other airlines, in JAL, galley work is both galley AND cabin for economy and some business class routes. So as a galley, you have to cook, prepare the meals, clear the rubbish, clear the galley, serve. Which the cabin duty just serves. But it is expected of the foreign base cabin duty to help in galley work too. You have to learn to stand up and protect yourself in any events where you might get implicated as once again I mention, Japanese people takes precedence and even your own office cannot do anything as the current union is not strong enough. Comparatively to Singapore airlines, our 777-300ER has only 13 crew while they have 18. So technically, everyone has to double up your speed and energy for flights. A good command in Japanese is useful. As if your command is weak, many chiefs will be triply strict with you and sometimes refuse to talk to you, only sending you out to serve passengers. Briefing is done is Japanese as well. Touching on routes, currently, Singapore base only have New York, Paris and Guam/KL. so each flight you do, is a minimum of 7 days. You have to fly into Haneda or Narita both of which is in the Tokyo prefecture. You do not get to do any domestic flights neither do you get to do any transit in other parts of Japan. We usually only stay at Marrod Hotel in Narita so if your next flight home or coming in flight is in Haneda, you must take a hour long bus to Narita airport before you catch another bus back to your hotel. In New York, our hotel is in Long Island which is about 45mins to Manhattan. In Paris, we stay in Novotel Eiffel. A 10minute walk away from the Eiffle tower. in KL, we stay at Saujana hotel. Guam flights are the worse as it is a turn around flight. The flight time is 3 hours up and 3 hours down. As there is no stay in Guam, you do not get per diem. You only get 15minutes to go through and back customs. Everyone hates this flight as we have to take the 7am bus to the office for briefing and only end your day back at hotel around 8pm. And as the flight time is only 6 hours in total, you only earn 30dollars for this whole day's work. Unfortunately, we are not allowed to swap flights unlike other airlines. So whatever you're given, you have to live with it. If you have personal matters you can only shift your personal matters around. Scheduling is done manually by office staff so unless you're a hot favorite or have exceptional Japanese language skills, your flights might have frequent Guam/KL flights. Personal relations is very important as it determines your flights. Recently a new policy of foreign base having to be sales n charge where you have to do the in-flight sales have been implemented. You have targets to hit but you do not get any commission. As pessimistic as it sounds, Japan Airlines is very routine work. Flying to the same places every month, you don't have to reconfirm all the station procedures and you always know where has what. If you like routine and is not in it for the money, Japan Airlines might not be a bad choice. Just be prepared to work hard, study hard! 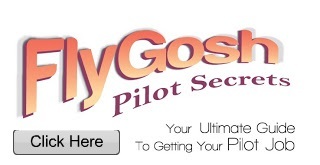 Flygosh.com will be a good place to start for all the cabin crew tips as well as latest jobs update.